When you look up 'ambitious' in the dictionary, you find a picture of this game. 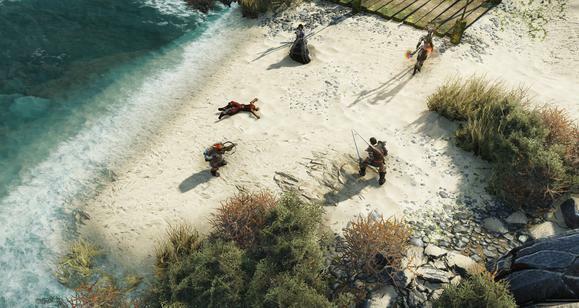 When talking about last year’s excellent Divinity: Original Sin, I’m fond of saying, “Imagine the game you’d get if, instead of dying off in the early 2000s, the isometric CRPG genre had kept evolving through 2014.” Now imagine that the same company came back afterward and pitched a sequel twice the scope. 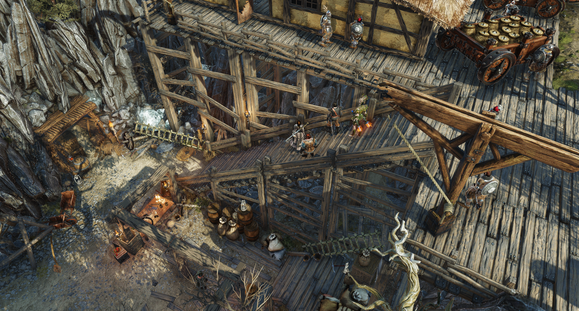 That’s Divinity: Original Sin II. Name-dropping Baldur’s Gate II, a.k.a. one of the most oversized, extensive RPGs of all time—and one of the best. That’s quite a target to aim for. Well I saw Original Sin II for about an hour earlier this week, and it looks ambitious as hell. Here’s what stood out. The original Original Sin (say that five times fast) was surprisingly sparse for character creation, considering the rich world Larian created. While classes were wonderfully fluid, your two characters were limited to human or…human. 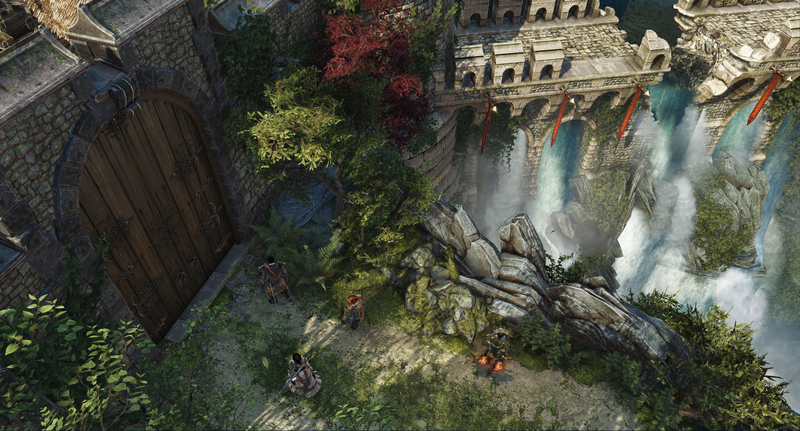 In Original Sin II, your character’s background is paramount. In addition to your class, you’ll be choosing race (humans, dwarves, and elves were on display in our demo) and potentially some sort of unique upbringing. This plays into pretty much every conversation and interaction you’ll have in Original Sin II. For instance, coming upon a statue on the side of the road we were shown how the four party members individually react. Lady Gwynne, who (according to her “Heiress” background) grew up in the area, related her fond memories of the statue from childhood. But our dwarf party member was unsettled, commenting on how the statue portrayed someone who famously massacred dwarves. And our elven party member didn’t even know who the statue represented. That’s only one small and insignificant example. During my hour-long demo I saw everything from a smuggler who would only talk to thief-class characters to townsfolk recognizing Lady Gwynne (and either condemning or supporting her) to a racist dog who’d been trained to hate dwarfs. It’s the sort of character-based responses Bethesda discussed for Skyrim but on a much larger level. And because people react to different characters in different ways, quests need to support multiple paths to completion. Original Sin was already pretty good about throwing in two or three paths to each objective, but Original Sin II appears to have even more branches. Upon entering town, we were informed that the mayor had been poisoned. The suspects? An anonymous dwarf and the mother of our very own Lady Gwynne—because, remember, we have the “heiress” trait. Forge evidence against the dwarf to get your mother out of jail. Forge evidence against your own mother to get the dwarf out of jail. Heal the mayor and ask who really committed the crime. Kill the mayor, talk to the mayor’s ghost, and again ask who really committed the crime. And then there are branches after those branches—if you find the real criminal, for instance, how do you handle that revelation? Some characters even have secondary quest goals. For instance, our human thief was let out of prison at the beginning of the game on condition that he kill a certain character—a character involved in this very quest. If he doesn’t kill his target, he’ll be in trouble. If he does kill the target, the quest will obviously play out differently. Now of course, what we’re playing in this preview is a guided demo—more indicative of Larian’s goals for Original Sin II than anything else. But if the finished product ends up as malleable as what I saw this week? Larian’s going to set a new standard for quest reactivity. 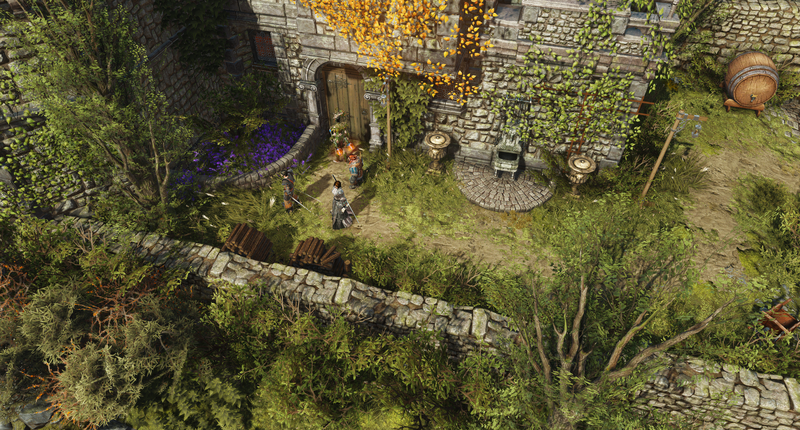 Speaking of which: Larian’s really talking up its focus on story, this time around. It’s one of the weakest points of the original game—fantastic mechanics saddled with a pretty bog-standard fantasy tale, albeit one bolstered by some hilarious dialogue. The story was in no way up to par with Wasteland 2 or Pillars of Eternity though, let alone something like The Witcher 3. It’s too early to get excited, but I was told the writing crew has expanded from “one and a half” writers on Original Sin to seven on Original Sin II (and potentially even more after the Kickstarter). Hopefully an increase in writing staff is commensurate with a similar increase in writing quality. A quick side note: Remember when I said you could talk to the mayor’s ghost? Yeah, that’s a thing now. Those who played Original Sin might remember the Pet Pal trait, which let you talk to various animals in the world. Well think that, except for ghosts. In Original Sin, you played the part of two Source Hunters—essentially bounty hunters/extralegal police who hunted down practitioners of a forbidden magic called “sourcery.” Original Sin II flips that, with four source-adept party members. As a result, there’s an entire Source branch of abilities now—ultra-powerful spells that require a “Source Point” to cast, as well as the standard turn-based combat action points. Source points can ostensibly be gathered in a few ways, but the most common we saw was also the darkest: Absorbing the souls of your dead enemies during combat. And as a handy, non-combat related side effect, you can talk to ghosts. Traditional spells also return though, and again Larian has done quite a bit to flesh out what was a pretty bare-bones concept in Original Sin. We ran through this system pretty quickly in our demo, but spell books are now a more codified part of the crafting system—meaning you can combine two spell books to create a brand new spell. We saw a few examples—the Mute spell plus Summon Spider equals “Summon a Stealthy Spider” and Lacerate plus Rain equals Blood Rain—but there’s no telling how deep the system goes yet. I asked whether you could combine second-level spells (i.e. Summon Stealthy Spider and Blood Rain) and got a pretty cryptic “We’d like to, but…” answer in return. But my key takeaway: Original Sin II is going to ruin friendships. 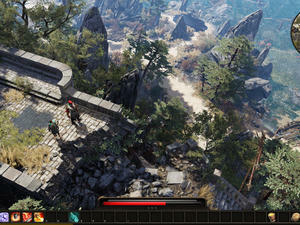 Original Sin allowed for two-person multiplayer, which was a pretty novel concept for a narrative-heavy RPG. Each person would roleplay a separate character, participating in conversations independently and potentially skewing quests one way or the other. 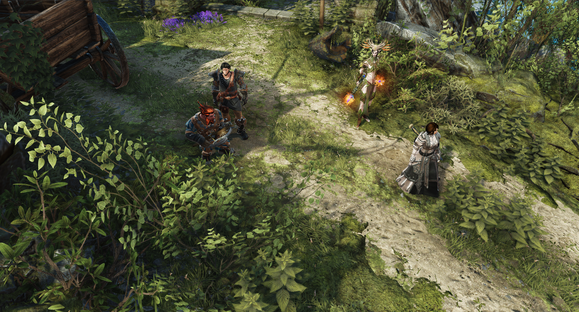 Original Sin II doubles down, allowing for four-person multiplayer—and each person can create a unique character at the start of the game. It looks like chaos. Remember up above, all the ways I said your background played into the story? Those aspects are really brought to bear in multiplayer. Getting into town, for instance. For Lady Gwynne, it’s easy. She’s from the town! The guards know her! Even though the town is semi-locked down, they just let her right in. Our human thief? He’s not above bribing the guards to get in. But our dwarf? The guards hate dwarves. Hate dwarves. After a brief (racist) exchange, they turn him away. The dwarf isn’t permanently locked out, of course. In our demo it led to a lengthy side bit where the dwarf snuck into the city through the slums. It’s more about slowing down your friends—allowing you to finish quests the way you think they should be finished—than outright breaking the experience for someone. Various quest solutions make a lot more sense for this four-person mode, where you’re potentially competing against friends. In that case, one player might forge evidence to get the dwarf out of jail—even if it means condemning another player’s mother to life in prison. And the pranks—oh wow, the pranks. Fill a bottle up with poison and dye it red, then stick it in someone’s bag. “Health potion?” they’ll say with relief, only to find themselves drinking poison. Or rush into combat and stab your friend in the back halfway through the fight. Or go to the guards and accuse other characters of smuggling so that they get searched on their way through town (and potentially thrown in jail). It’s an outright nightmare. How well do you trust your friends? I like what I’ve seen. Divinity: Original Sin was one of my favorite games last year, and Original Sin II looks like a very ambitious follow-up. Honestly, so ambitious I’m not even sure Larian can pull it off. But I’m hoping they can, because if successful Original Sin II is poised to shake up not just isometric RPGs but the whole RPG genre. 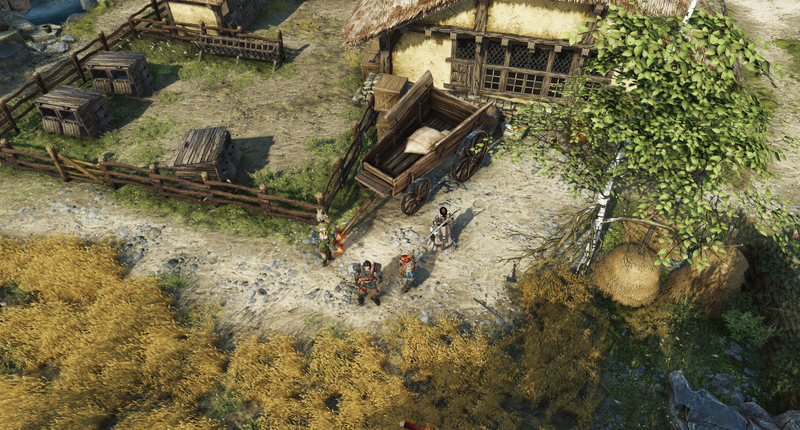 Larian is currently running a Kickstarter campaign to raise $500,000 for Divinity: Original Sin II's development.